ab33827 recognises CD11b expressed on most macrophages, including resident and activated peritoneal macrophages, Kupffer cells, around 35% of alveolar macrophages, dendritic cells, granulocytes and microglial cells in the brain. Our Abpromise guarantee covers the use of ab33827 in the following tested applications. Use neat - 1/10. Use 10µl of the suggested working dilution to label 106 cells in 100µl. ab18418 - Mouse monoclonal IgG2b, is suitable for use as an isotype control with this antibody. Samples need to be PLP (periodate-lysine-paraformaldehyde) fixed. 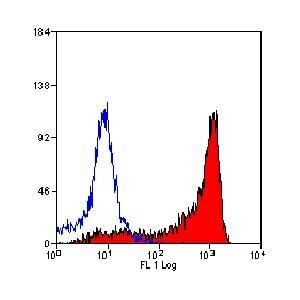 FACS analysis of rat peritoneal macrophages using ab33827. Can a biotin-conjugated Ab be detected using streptavidin-HRP? Yes, a biotin-conjugated Ab can be readily detected via streptavidin conjugated to HRP. The biotin-streptavidin interaction is very specific and of very high affinity. One option for a ready-to-use streptavidin-peroxidase product can be found here: Streptavidin Peroxidase (Ready to Use). Can you provide any recommendations or references for use of an anti-CD11b Ab in with fluorescent staining methods? Are specific fixation methods recommended? Stidworthy MF, et al. Notch1 and Jagged1 are expressed after CNS demyelination, but are not a major rate-determining factor during remyelination. Brain. 2004 Sep;127(Pt 9):1928-41. Epub 2004 Aug 2. PMID: 15289265. Lehrmann E, et al. Microglial and macrophage reactions mark progressive changes and define the penumbra in the rat neocortex and striatum after transient middle cerebral artery occlusion. J Comp Neurol. 1997 Sep 29;386(3):461-76. PMID: 9303429. Milligan CE, et al. Differential immunochemical markers reveal the normal distribution of brain macrophages and microglia in the developing rat brain. J Comp Neurol. 1991 Dec 1;314(1):125-35. PMID: 1797868.